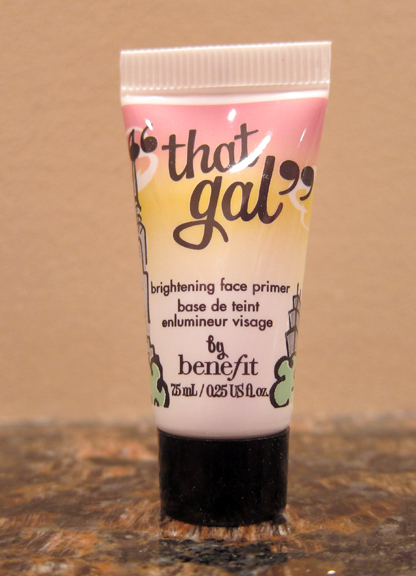 THE SKINNY: Benefit's "That Gal" is one of my favorite highlighting primers. I've been using it almost daily to brighten the area under my eyes. The fact that it's a primer that helps my powder stick better, is just an added bonus. This is sheer-yet-sparkly pink cream. It's extremely lightweight and glides onto my skin. You don't see pink on your skin, but you will see the area get brighter and reflect the light. I often use this product alone on the weekend in place of powder, just to add a little glow to my face for running errands. KEEP OR TOSS: Keep. You can often find sample sizes of "That Gal" with beauty boxes or at the sample counter at Sephora. CHECK IT OUT: Benefit lets you ask questions about its products on its website. Find the Q&A for "That Gal" here.